Basil is too fragile to withstand the direct heat of an oven. So, here, it's puréed with olive oil then incorporated into a bread dough. In a warm bowl, combine the flour with the semolina, yeast, sugar and salt. Measure out about 600ml warm water. Make a dip in the flour and add most of the warm water. Work it gradually into the flour until you have a rough dough, adding more water if necessary. Tip onto a lightly floured surface and knead for about 10 minutes until you have a smooth, soft dough. Alternatively, knead in a food processor with a dough hook. Put the dough in a lightly oiled bowl, cover with oiled clingfilm and set in a warm place until light, spongy and doubled in volume - there's a lot of yeast in the mix, so this should only take about 30 minutes. Meanwhile, in a small pan, heat the olive oil for the basil oil very gently until warm but not hot. Add the basil and remove from the heat, then purée in a food processor. Knead the dough for 2-3 minutes to expel the gasses, then roll or pat out to a large rectangle about as thick as your thumb and around 60 x 25cm. Brush a large baking sheet (choose one with a raised edge) with oil and dust lightly with a little semolina. Lay the dough rectangle on the baking sheet with the two ends flopping over the sides. Trickle with half the basil oil and fold the two sides over into the middle to enclose the oil. Make dimples in the dough with your fingers. Drop the halved tomatoes and olives into the dimples. Cover with oiled clingfilm and set in a warm place to rise for half an hour. Preheat the oven to 180°C/gas 4. Trickle the dough with the rest of the basil oil and dust with a little more semolina. Bake for 25-35 minutes until well-risen and golden. Transfer to a rack to cool, then serve. 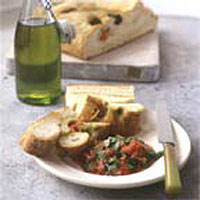 This is great as a starter with dips or salsa, or on a picnic with Parma ham, salami and cheese. It also freezes well - reheat before serving.